Tallahassee, Fla.—In an effort to keep Florida residents and visitors safe and aware about the status of the Zika virus, the department will issue a Zika virus update each week day. Updates will include a Zika case count by county and information to keep Floridians informed and prepared. In order to keep the public informed, the department has posted our investigation process here. There is one new travel related case today in Orange County. Please visit our website to see the full list of travel-related cases. There are seven new non-travel related cases today. Six are associated with the Miami Beach investigation. One is a new investigation in Miami-Dade County. The six new cases associated with Miami Beach were confirmed Friday, but are being formally announced today due to Hurricane Hermine closing state offices on Friday. DOH continues door-to-door outreach and targeted testing in Pinellas, Palm Beach and Miami-Dade counties and mosquito abatement and reduction activities are also taking place around the locations that are being investigated. 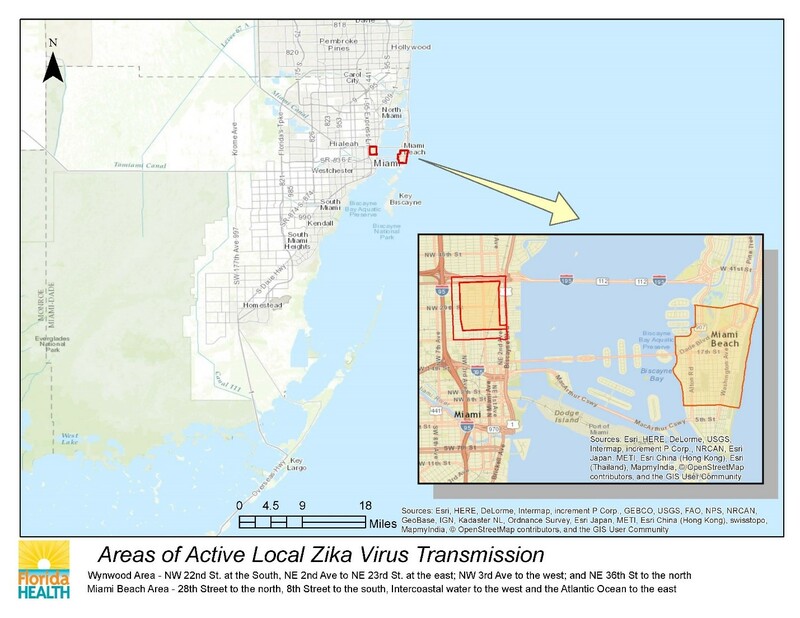 DOH believes ongoing transmission is only taking place within the small identified areas in Wynwood and Miami Beach in Miami-Dade County, see maps below. One case does not mean ongoing active transmission is taking place. DOH conducts a thorough investigation by sampling close contacts and community members around each case to determine if additional people are infected. If DOH finds evidence that active transmission is occurring in an area, the media and the public will be notified. The department is currently conducting 14 investigations. Information regarding the investigations can be found here. If investigations reveal additional areas of active transmission, the department will announce a defined area of concern. The department has conducted Zika virus testing for more than 5,910 people statewide. Florida currently has the capacity to test 5,678 people for active Zika virus and 6,748 for Zika antibodies. At Governor Scott’s direction, all county health departments now offer free Zika risk assessment and testing to pregnant women. 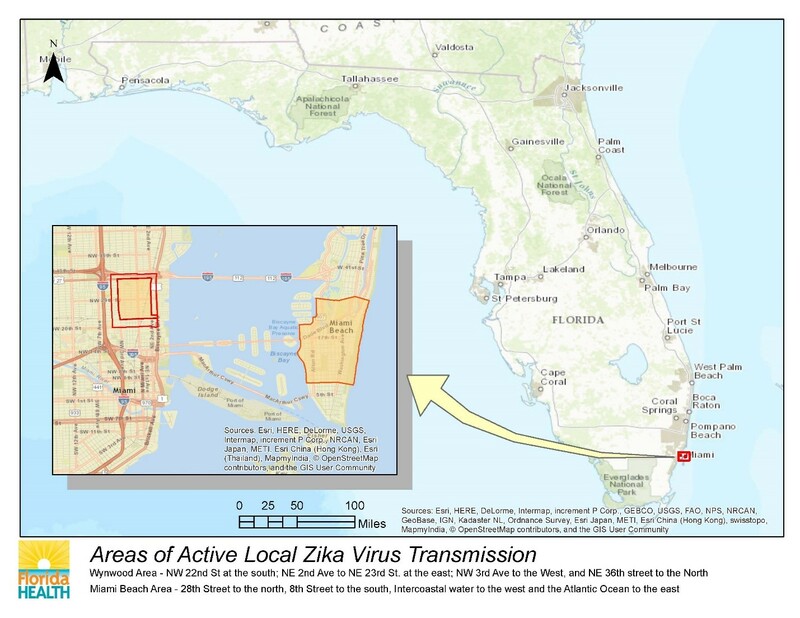 Florida’s small case cluster is not considered widespread transmission, however, pregnant women are advised to avoid non-essential travel to the impacted area in Miami-Dade County (see map below). If you are pregnant and must travel or if you live or work in the impacted area, protect yourself from mosquito bites by wearing insect repellent, long clothing and limiting your time outdoors. According to CDC guidance, providers should consider testing all pregnant women with a history of travel to a Zika affected area for the virus. It is also recommended that all pregnant women who reside in or travel frequently to the area where active transmission is likely occurring be tested for Zika in the first and second trimester. Pregnant women in the identified area can contact their medical provider or their local county health department to be tested and receive a Zika prevention kit. CDC recommends that a pregnant woman with a history of Zika virus and her provider should consider additional ultrasounds. Additionally, the department is working closely with the Healthy Start Coalition of Miami-Dade County to identify pregnant women in the impacted areas to ensure they have access to resources and information to protect themselves. CDC recommends that a pregnant woman with a history of Zika virus and her provider should consider additional ultrasounds. Florida has been monitoring pregnant women with evidence of Zika regardless of symptoms. The total number of pregnant women who have been or are being monitored is 80. On Feb. 12, Governor Scott directed the State Surgeon General to activate a Zika Virus Information Hotline for current Florida residents and visitors, as well as anyone planning on traveling to Florida in the near future. The hotline, managed by the Department of Health, has assisted 5,541 callers since it launched. The number for the Zika Virus Information Hotline is 1-855-622-6735.